The Municipality of Loay has various attractions aside from the beaches, the sea, the natural contours of the coastline, rolling hills and mountains. The Loay Church is dedicated to the Blessed Trinity or the “Santissima Trinidad”and sits on a plateau facing the sea and near the mouth of the Loboc River. 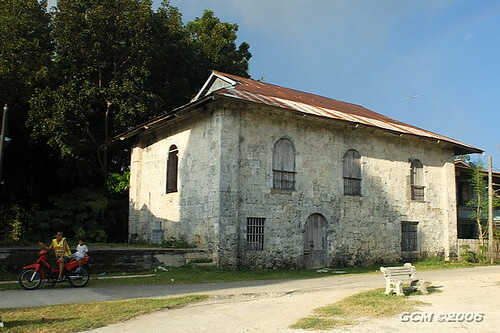 Old and charming, the church is made of coral stone and reinforced with concrete. The church’s dome and ceiling are painted with biblical figures and scenes. A separate belfry is at its side and is only a few steps away. The Loay Plaza Complex includes a large open space with a simple stretch of grass; not landscaped or anything. It is a refreshing sight, unimposing and not over decorated, ending with a walkway or boulevard along the coastline near the mouth of the Loboc River. There are two coral stone buildings flanking the plaza; one is used by the public school and the other two-story building being renovated eventually to be used as an archdiocesan archive of papers and church documents from the Spanish period of the 38 parishes comprising the diocese. Both buildings were designed plainly, sedate and classical in temper, bereft of ornamentation except for the emblem of the Virgin Mary on the two story structure. The house is situated at the foot of the hill where the church is located. It is the ancestral house of the Clarin family and houses its memorabilia. The Clarins are one of the politically prominent families of Loay town. The loay watchtower is located at the seaside barangay of Villalimpia, Loay, Bohol, near the mouth of the Loboc River. Like all other watchtowers that dot the coastline of Bohol, the tower was used to serve as a watch point for any incoming marauders that may attack the town so that the people can scamper to safer ground and prepare for battle. At present, it lies at the edge of a mangrove forest and accessible by sea. The Himontagon Hills is only 20 kilometers away from Tagbilaran City. Up on the hills, one will have a vantage view of faraway Camiguin Island as well as other scenic spots of Loay and neighboring towns. It is the perfect place for trekking and hiking, and with the added bonus of cool fresh air for good health.